While my mom was visiting last month I wanted to take her away from Phuket for a little bit. We decided on Khao Lak, which is just a short drive north of Phuket. We booked our room for three days and two nights and made the drive on up. 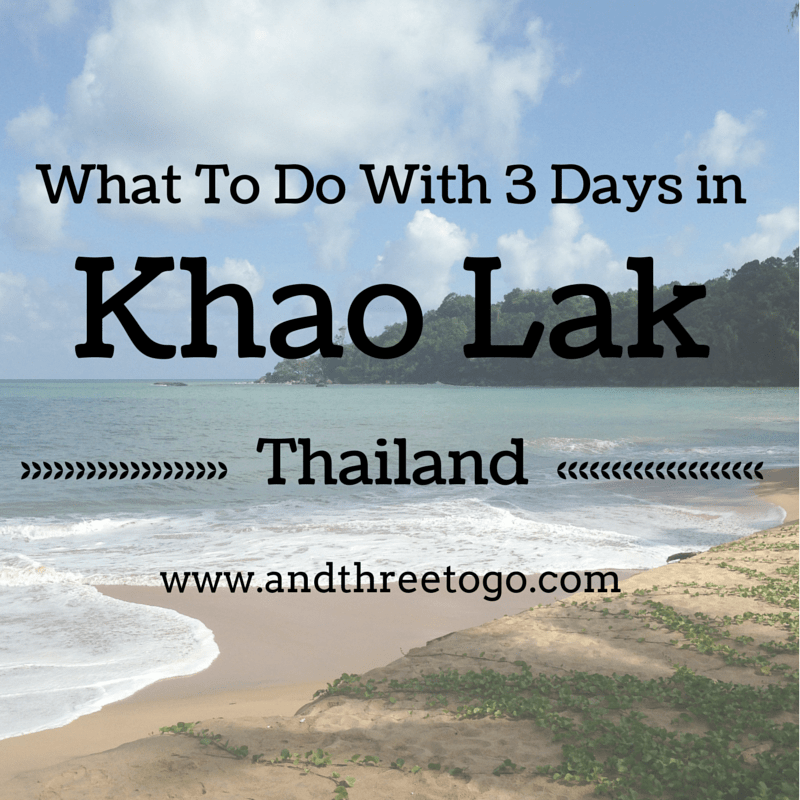 So what does one do with three days in Khao Lak? RELAX! Oh, and get a fabulous tan! And eat amazing food! Sounds heavenly right? Well it was! We booked our room on Khao Lak Beach (the southern most beach in the area) in the beautiful Briza Beach Resort. The pampering started from then on. We were given fresh herbal-infused water while we registered for our very fairly priced room (around 1200 baht a night or $40 use). The room included a breakfast buffet, which is something that I always look for when booking a room. It is the most important meal of the day! The grounds of the resort were beautiful, and split in two. On one side, the decor was more Thai style, with dark wood (possibly teak) furniture and balconies. There was a huge pool with two smaller pools on that side. Walking further, there was a small restaurant/bar and then the ocean. The other side of the resort was were we had booked our room and it was decorated more in the mediterranean theme. the two sides didn’t really compliment each other and on their own were quite nice. Our room had two twin beds, a balcony, and plenty of room for the three of us comfortably. Right outside our balcony was one of the pools, though since we were on the second floor, it was just a nice view. The resort offered rooms that had balconies that had pool access, but they were a bit more costly per night and it wasnt that important to us. The first order of our day there was to go in the pool! There was one goal my mom had in visiting (besides seeing us of course) and that was to get a tan. I am never opposed to having golden brown skin (while still using sunscreen, don’t worry), so we went to work right away. We started out in the pool near our room. It was a great time. We swam to our hearts content and then decided to go to the resorts beach bar for some dinner. The dinner was sub par and pretty expensive (about 1000 baht for the three of us, $30 usd). Then we walked around the little area around the resort. There were some restaurants, shops, and convenience stores. It was very quiet and pretty sparse. So we headed back to the room for an early bedtime! Awww… sweet relaxation and sleep! The next day, after a pretty good breakfast buffet, we were all about the pools again. This time we went to the ‘Thai’ style side and swam like fish until lunch. Then we decided to have Z’s hair braided, as is our custom whenever we go out-of-town. She sat for 3 hours! Poor thing, next time we will only do half her hair because that was a long time for anyone to sit, let alone a 4-year-old. Having my tea and preparing for another great day! Z got to play in the kids room while we grown-ups finished our breakfast. The rest of our time was about swimming and tanning. Honestly, we took a look at the ocean, but since it is low season the water was pretty rough and the pools were just more inviting. The beach was beautiful though and I would love to check it out during high season next time. That night we went to an AMAZING restaurant called Smile and had delicious food and drinks. More about the restaurant in next weeks post, it was so good that it warrants its own write up for sure. The next morning was more swimming and then driving the short distance back to Phuket. All three of us were more tan and relaxed after our time in Khao Lak. It was a perfect place to get some much-needed rest. For more information on what you can do in Khao Lak if you actually want to move, check out Jamie’s Phuket Blog and his post about it. Make sure to come back next week (or subscribe if you haven’t already) for my review of Smile Restaurant in Khao Lak! Now it’s your turn! Are you more of a relaxer on holidays, or a get-out-and-doer? Leave a comment and lets chat! I’m definitely more if a doer. I don’t swim, and hanging out to get a ran just doesn’t cut it for me :-). I always compromise though so he can get his tan, that’s when a good book and umbrella come in handy.. :-). I like that pool though, looks shallow. Sounds like the perfect break! Lots of swimming, relaxing and great food – what could be better. Wow, it sounds and looks awesome! I got hooked on herbal infused water this past week at the conference I was attending. It was available all day long, and I drank at least 5 large cups of it every day. My favorite was strawbery-lime-basil. Delicious! Yummy! I love strawberry line basil… There is a place here that makes that a smoothie! It’s delicious! The pool concept is fairly cool and I would imagine there was a lot of space to swim, too, so even better. Yeah, when I go on holiday I don’t really laze around, but it always sounds like a nice thing to do. Maybe I’ll have one of those lazy getaways one of these days. I must try it! I am so glad you enjoyed it mom! It was such a wonderful time for us all! Did you sit for 5 minutes? Hahah jk! Doesn’t “Z” look super cute in her summer hair-do! I’m more of a get-out-and-doer when I’m on holiday and even though water is my favourite element, and I’ve onyl ever lived in counries where the river or sea is a part of the soul of the destination, a beach holidays isn’t really my thing, unless it’s surrounded by things to doooooooo! Victoria@ The British Berliner recently posted…I’m going to Budapest & Prague AND taking the train. Yay!